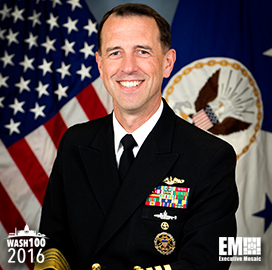 Executive Mosaic is honored to introduce Chief of Naval Operations Adm. John Richardson as an inductee into the 2016 edition of the Wash100 — Executive Mosaic’s annual selection of influential leaders in the government contracting arena. Richardson has served as the Navy’s top uniformed officer since his confirmation in August 2015 and succeeded Adm. Jonathan Greenert in the role. 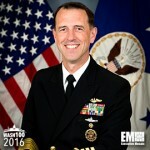 He has directed the Naval Nuclear Propulsion Program since 2012 and held several command and staff assignments at the U.S. Navy, including leadership of submarine forces deployed in Europe and Africa. In a December speech to the U.S. Naval Institute, Richardson advocated for the service branch’s use of carrier-launched armed drones to support both surveillance and combat missions. According to a Reuters report then, the Unmanned Carrier-Launched Airborne Surveillance and Strike program could see bids from Boeing, General Atomics, Lockheed Martin and Northrop Grumman. “That’s a prime candidate for trying to get something out there… so that we can learn how to operate an unmanned aerial vehicle from a carrier,” Richardson said. Richardson also led the release of a guidance document in January that provides strategic approaches to help the Navy’s efforts to achieve maritime superiority. Executive Mosaic congratulates Adm. John Richardson and the U.S. Navy team for their selection to receive this award.